Nagios is an incredible tool for monitoring your IT infrastructure. It offers monitoring and alerting for servers, switches, routers, firewalls, applications, services, and can be configured for just about any networkable device using SNMP. As powerful as it already is, a multitude of third party and official plugins, and client-side agents can be configured to increase efficiency and extend functionality. One of the biggest complaints I hear about Nagios is the complexity involved in configuring it. One of my challenges while I was deploying a Nagios monitoring system to a client was that the implementation needed to be maintained and expanded upon with relatively little Linux knowledge or in-depth understanding of Nagios itself, after I was gone. The solution I came up with for this particular client was Centreon. 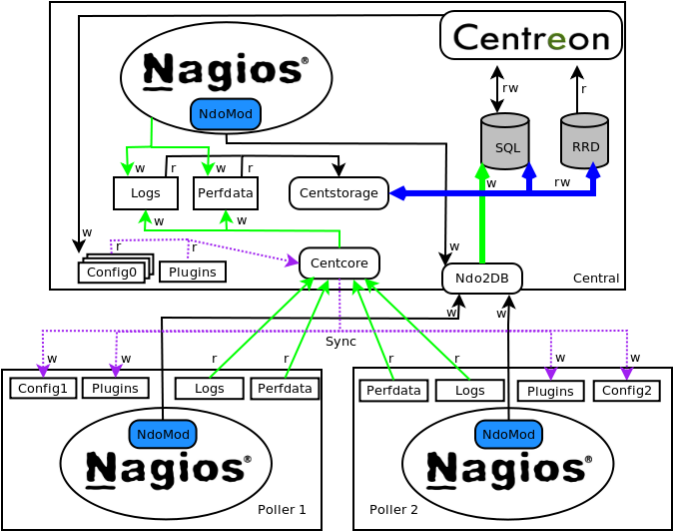 Centreon is actually a full featured monitoring solution in itself, but uses Nagios as a back-end. 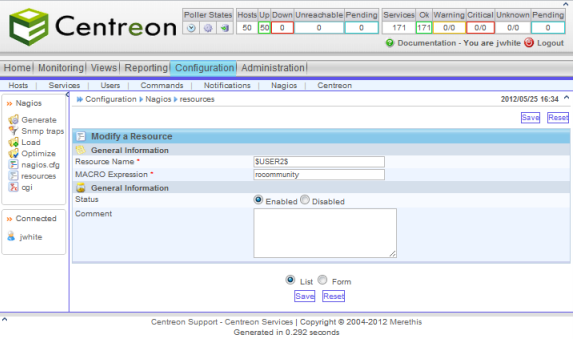 This means that while configuration and monitoring is done from within the Centreon web UI, there is still a fully functional instance of Nagios running in the background that does all of the work you would expect. In this way, Centreon can be thought of as a very full-featured front-end interface, although it brings together a few other tools and custom functionality above and beyond a typical Nagios installation. Anyway, in this post, I will detail the steps involved in getting Nagios & Centreon set up for monitoring your network. This guide is based on CentOS 5, but can easily be adapted to any Linux distribution. Edit RPM-GPG-KEY.dag.txt so the first line is "-----BEGIN PGP PUBLIC KEY BLOCK-----"
Keep in mind, the version number reflects the version available when I did this. It will change over time, so you will have to find the available version if this doesn’t work for you. NDOUtils is essentially a tool that allows Nagios to interact with a database, rather than use direct input/output. 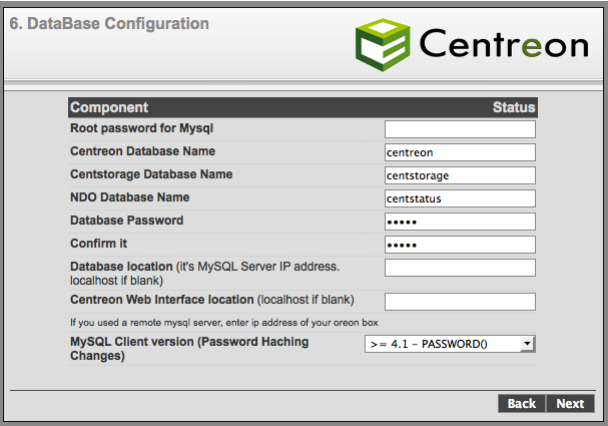 It is required because Centreon is database driven in that all of the configuration, history, and events are stored in a database. The Centreon install process is an interactive script, so it is fairly straightforward with only a few gotchas which I will note below. The script will now check all prerequisites, and then ask you to accept the license. Accept the license, and then walk through the install questions, answering yes (‘y’) to everything, and accepting the default paths. If prompted to update the PEAR modules, say yes. Continue through the rest of the setup… Do not enable LDAP. Make note of all your passwords. Check each of these services using the syntax above when troubleshooting issues with Nagios or Centreon. They should also be started in this order. By following this guide, you will have a basic fresh instance of Nagios and Centreon ready to go and play with. There are many features to explore and things you can do with these tools, so look around the interface and try to explore as much as you can (The Centreon wiki and forums are a great place to start). In later posts, I will discuss how to do some more basic and advanced functions with the software.